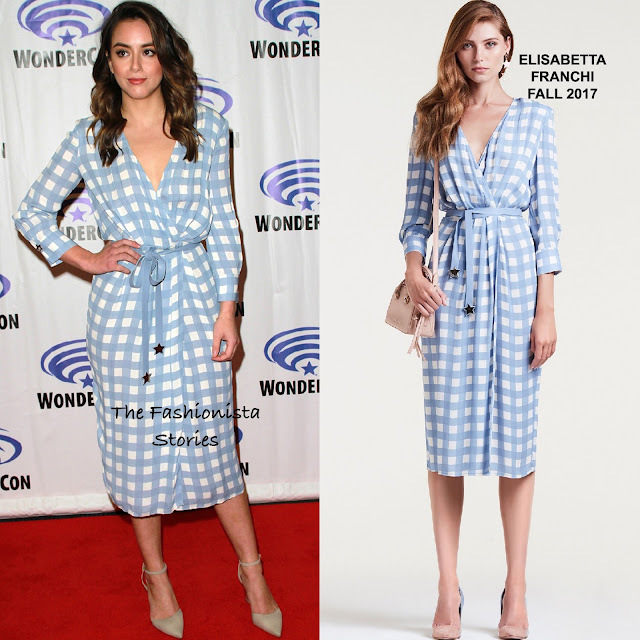 On Saturday(March 24th) Chloe Bennet hit the red carpet at the 2018 WonderCon 'Marvel's Agents of S.H.I.E.L.D.' Press Room at the Anaheim Convention Center in Anaheim, CA. For her attendance, she turned to what seems to be one of her favorite designer, ELISABETTA FRANCHI. Her FALL 2017 light blue & white check print crossover dress stopped just below her knees and featured a light blue sash with an embellished star at the end. She offset her check print dress with sand colored, ankle strap pumps which topped off her look along with side parted layered waves and a pink lip color.